One day in July last year when Mr. Ronnie Frazier was working at E-Z Mart, he was confronted by an armed robber demanding money. Instead of immediately giving him the cash, Mr. Frazier calmly asked the man why he needed the money. Upon learning that he needed US$40 for medicine, Mr. Frazier gave him the exact amount from his own wallet. 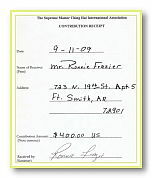 Touched by Mr. Frazier’s kindness, the man accepted the money, thanked him, and left. 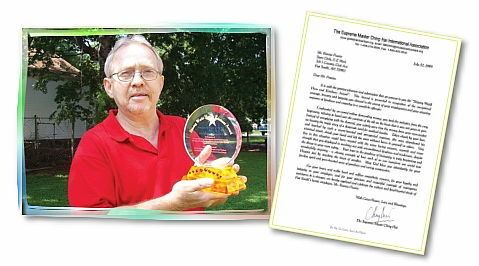 On September 11, Golden Year 6 (2009), members of the Supreme Master Ching Hai International Association went to Ft. Smith, Arkansas to present the Award to Mr. Frazier at his home, where they were warmly received. Along with the beautiful plaque and letter, a Hero T-shirt, Master’s publications and vegan sweets, Mr. Frazier also received a check of US$400 from Master. Overwhelmed by Master’s generosity, Mr. Frazier expressed his hope that the world would become more giving and closer to God.